If you are planning to orienteer regularly, it is recommended you become a Full Club member of OWA. OWA is divided geographically into six clubs; four in the Perth Metropolitan area (see map of Perth), one based in Bunbury and one in Albany. This is to allow simple division of labour for organising events, as well as planning social and coaching activities with nearby orienteers. You can join any club you like, but you will need to pick a club before you submit your membership application. Talk to people at events, meet the club members and select a club based on where you live or a club with people you know. Members of all clubs can participate in any orienteering event. Bibbulmun Orienteers (BO) : Kalamunda and the Perth Hills area. Named after the Bibbulmun people - the traditional Aboriginal landowners of the area. Kulgun, in a local Aboriginal dialect, means "best path" and 225 is the compass bearing from the Perth City centre to the KO area. LOST is an acronym that stands for nothing. Rumours that the name means something are hotly denied. Wullundigong is an Aboriginal word meaning "little men of the forest", but neither height nor gender restricts membership. 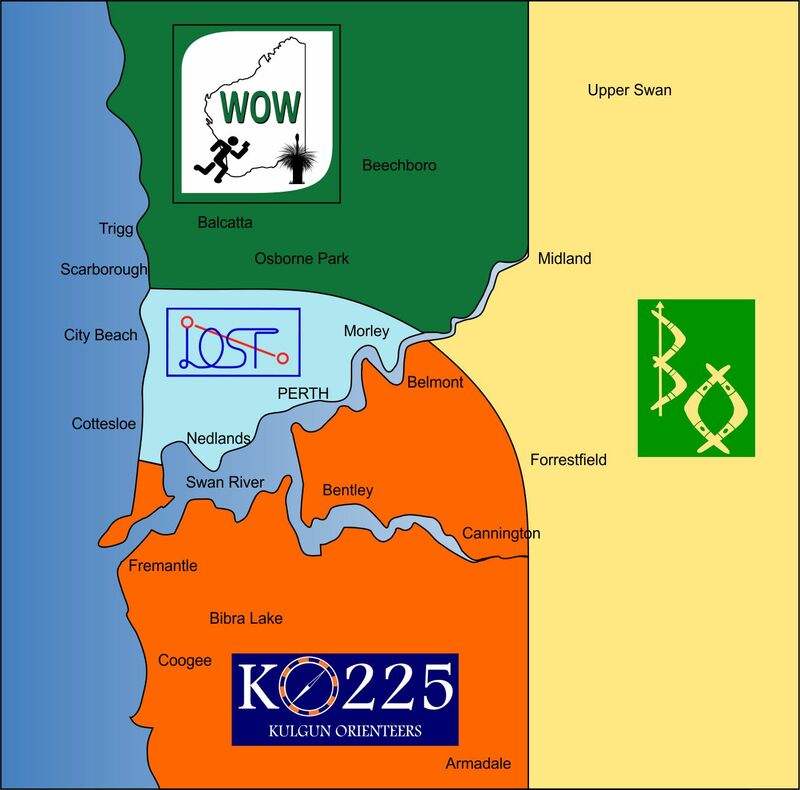 Formed in 2014 by a group of local enthusiasts with the aim of bringing orienteering to the Great Southern. SWOT are affiliated to OAWA but given their location based in Bunbury run their own events. Orienteering relies entirely on people sharing the many jobs, with most of these being easy to learn and pleasant to do. Everyone benefits from this sharing of the workload. As a club member your help will always be welcome. In the summer each club elects its Convenor and Standing Committee representatives. Club members then prepare rosters of volunteers for the main duties for the next season. During the year the Convenor oversees all club activities including membership. The Convenor also represents the Club at OWA Council meetings. Technical, Coaching, Mapping, Schools, Promotion and Publications representatives work in their areas with their Club members. These representatives form OWA's Standing Committees. The Technical representative arranges volunteers for jobs at events assigned to the club by OWA, particularly for the setting of courses and for event administration. The Social organiser is responsible for the club's social activities. The appropriate representative in your club will be glad to hear your questions and ideas about these activities. A good starting point for any orienteering-related queries is to contact your club convenor. If they are not the best person to help you, they will be happy to help you find someone who is. Club News columns appear in our regular newsletter and on the club web pages, which are maintained by the clubs.